GM's U.S. light-truck sales surged 42 percent in September, while car volume rose 6 percent and crossover deliveries increased 9 percent. †Fiat S.p.A. purchased the remaining 41.46% stake in Chrysler Group from the UAW's VEBA Trust on Jan. 20, 2014. U.S. light-vehicle sales -- paced by truck-fueled gains at General Motors, Chrysler Group and Nissan Group -- rose 9 percent in a September marked by sharp brand advances and a few steep declines. The results were just below forecasts and cooler than the scorching rate set in August. Still, they reflect a market coasting toward its fifth straight year of recovery following the 2007-09 recession. Fay’s remarks came as parent Toyota Motor Corp. tallied a 2 percent gain, one of its weakest performances in months. Ford Motor Co. again trailed the industry, this time with a 3 percent decline. In a reporting quirk, GM, Chrysler and Nissan each chalked up 19 percent gains, while the Volkswagen brand and Toyota’s Scion tumbled 19 percent. Subaru, which has passed VW in the brand sales rankings this year, was up 31 percent. It extended its U.S. sales streak to 34 months after raising its volume target for 2014 to 500,000 units. The seasonally adjusted annual sales rate hit 16.4 million, just below analysts’ forecasts in the 16.5 million range. September’s SAAR was up sharply from 15.4 million a year earlier and well below August’s 17.5 million, the strongest pace since January 2006. Swings aside, the SAAR has now topped 16 million for six straight months. Honda Motor Co. had a 12 percent gain in September on a 19 percent rise at the Acura brand and 11 percent jump at Honda. Two Honda models -- the Fit and CR-V -- set September sales records, the company said. GM said it delivered 223,437 vehicles last month, with retail volume up 17 percent and fleet shipments jumping 30 percent. Sales rose 28 percent at GMC, 20 percent at Chevrolet, and 12 percent at Buick. Volume was flat at Cadillac. Overall, it was GM's strongest gain since the company's sales rose 20 percent in September 2011. The company's light truck sales surged 42 percent last month, while car volume rose 6 percent and crossover deliveries increased 9 percent. Another month of robust demand for Ram pickups and Jeeps, combined with some of the industry’s highest discounts, spurred Chrysler Group’s 19 percent September advance. Toyota said it sold 167,279 Scion, Toyota and Lexus models last month. Sales rose 1 percent at the Toyota division and 12 percent at Lexus. Deliveries at the Ford brand slipped 3 percent while volume rose 13 percent at Lincoln. Ford said its retail sales totaled 137,297, a gain of 2 percent, while fleet deliveries fell 14 percent to 42,878. The VW brand’s 19 percent drop marked its 18th straight month of decline. A freshened Jetta arrived in showrooms late last month as the car was on its way to a 23 percent fall for the month. Audi deliveries rose 14 percent to 14,917 as the German luxury brand’s winning streak rolled along for the 45th consecutive month. The new A3 compact buoyed Audi’s performance, with sales of 2,340, offsetting declines in A4 and A6 volumes. Jaguar Land Rover also posted a decline in September volume, with Jaguar off 13 percent and Land Rover down 8 percent. Volvo ended a four-month sales skid with an 11 percent gain in September. At Chrysler, Jeep sales rose 47 percent and Ram pickup volume increased 30 percent to 36,612 units, the company reported. Chrysler Group’s U.S. sales totaled 169,890, edging past Toyota, and have now increased 54 consecutive months. Volume rose 35 percent at the Ram brand, 14 percent at the Chrysler brand, and 6 percent at Fiat, while sales skidded 9 percent at Dodge. Chrysler brand deliveries were driven by the redesigned 200 midsize sedan and the Town & Country minivan. Sales of the 200 rose 15 percent last month to 10,995, its best showing ever in September, the company said. Overall, Chrysler Group’s light truck deliveries jumped 30 percent while car sales slid 7 percent. Reid Bigland, head of U.S. sales for Chrysler Group, credited “continued consumer demand” for the 200, Jeep lineup and Ram pickup for the company’s latest results. TrueCar.com estimates the company’s incentives averaged $3,644 in September, up 16 percent from a year earlier. Edmunds.com pegged Chrysler’s average spiff per vehicle sold at $3,281, an increase of 22 percent from September 2013. Nissan Group's advance was spurred by its namesake division, up 22 percent. The Versa and Sentra small cars and Rogue compact crossover were among the standouts. Sales at the Infiniti luxury brand fell 13 percent. The Nissan Group’s light trucks rose 27 percent, easily outpacing the 13 percent gain in the company’s car volume. Hyundai reported sales of 56,010, an increase of 2 percent for the month, on strong demand for the Santa Fe and Santa Fe Sport. “Following a red-hot August, sales cooled a bit in September as we held the line on our incentive spending in a very aggressive market,” said Bob Pradzinski, vice president of national sales for Hyundai Motor America. Mazda and Kia each posted gains of 7 percent, while Mitsubishi continued its comeback with a 39 percent increase. U.S. light-vehicle demand has climbed 6 percent through September and is on track to hit 16.4 million for the year, analysts say. Light trucks are propelling the market higher this year, with combined sales of pickups, crossovers, SUVs and vans rising 10 percent, compared to a 1-percent gain for cars. In September, light truck demand jumped 17 percent while car deliveries rose just 2 percent. Several forecasters raised their outlook for 2014 industry sales after the final August tally blew past projections. "It's been a while since the auto industry enjoyed such a strong quarter. It's clear that the American public feels better about buying new cars," said Jessica Caldwell, senior analyst for Edmunds.com. "Automakers have struck the right chord by putting more emphasis on leases and opening credit to a larger cross-section of buyers. Expect the same trends to continue through the end of the year." Across the industry, discounts on new cars and light trucks averaged $2,801 in September, according to TrueCar. Edmunds estimates industrywide deals last month averaged $2,423. In addition to attractive lease deals and steep discounts on 2014 models, steady economic growth and falling gasoline prices are helping entice Americans to showrooms. Szakaly said the decline in gasoline prices will also aid consumer confidence and auto sales in coming months. GM, citing J.D. Power and Associates data, said strong demand for trucks and crossovers helped the company generate average U.S. transaction prices of about $34,600 last month, the highest ever. Average transaction prices were up about $1,200 per unit compared with August, and up about $2,500 per unit from Sept. 2013, GM said. 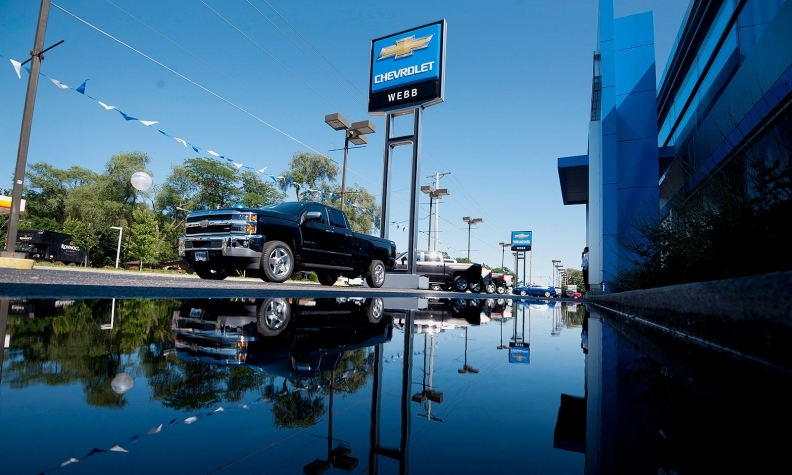 “Floor traffic should remain elevated with GM and other [automakers] stepping up incentives as part of their annual promotion campaigns,” Jonas wrote in a report to investors, noting GM offered special deals on trucks in September. On Monday, top Ford executives predicted U.S. light vehicle sales will probably rise for a rare sixth straight year in 2015 and may exceed 17 million for the first time since 2001. Deliveries of new cars and trucks will rise to 16.8 million to 17.5 million, including about 200,000 medium- and heavy-duty trucks, Ford told investors. U.S. light-vehicle sales haven't exceeded 17 million since 2001, when automakers, led by GM, lured consumers to showrooms with no-interest loans following the Sept. 11 terrorist attacks. Luca Ciferri, Ryan Beene and Bloomberg contributed to this report.